I might be in the market for a B7500. Will this have a smaller three point hitch than the cat 1? If so, will this limit me to what I can run as far as being able to lift the implement high enough off the ground- like an auger? Also, anybody have any experience plowing snow with this model? Garden tractors have the next size down, but this is a compact ag tractor that would surely be cat. 1. Snow work depends less on the brand or model than on tires, chains, added weights, type of pusher (plow or blade, F or R), and drive system. To explain the latter, 4WD can effectively be 2WD (if there's no locking diff F & R), or most commonly 3WD (there's a R but no F lock) or 4WD (if lock on both F & R). Is a B7500 a compact or a sub-compact? Isnt there a pretty good difference? I think it is a compact. I think sub-compacts have 12 inch rims on the back like the BX series. I am also sure that the B7500 has a full cat 1 hitch. 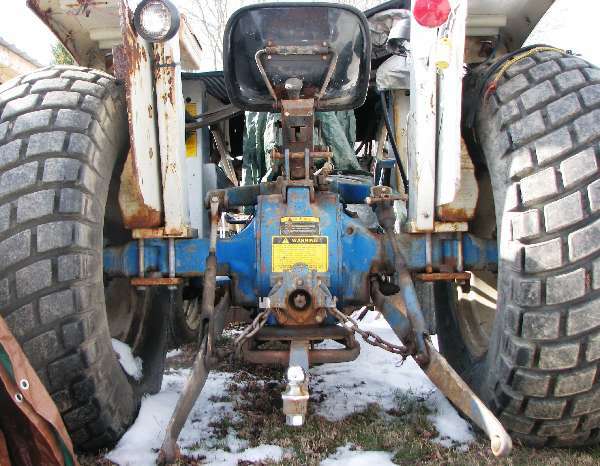 If you want to plow snow you will need something other than R-1 Ag tires. Someday I will need to plow snow- for now I am in Texas. For a couple years now I have had my eyes on a bigger tractor, but now it looks like I might be needing a tractor with a mid mount pto for mowing. The B7500 is almost identical to my B2100. It is a compact tractor with a standard sized Cat1 3-point hitch. You should be able to use any Cat1 implement with that tractor, but the horsepower rating of the B7500 will definitely limit the size of your implements. For example, you can easily attach to any Cat1 rotary mower, but you probably won't be able to get the best performance out of anything larger than a 4-foot model. If you were to hook up to a 5-foot mower, you'll find that you'll have to travel very slowly though the heavier brush and tall grass. A 6-foot Cat1 mower would probably kill the engine in the taller grass, at any speed. For finished lawns, the B7500 equipped with a 60 inch mid-mount mower deck, would be just fine. No problem at all. Cando- you were the one who had a post about a year ago specifically addressing the issue of hitch sizes- It's good to know that the B7500 should be cabable of accomadating most implements, even it the performance is lacking. Think it could get an auger high enough for travel? Yes. You should be able to go to just about any farm supply store and pick up a 3-point post-hole auger that will fit and work just fine with the B7500. The B7500 isn't a very tall or powerful tractor. The auger will just barely clear the ground when traveling. You'll find that it will dig a nice hole for you though, so long as you don't attempt to go much bigger than about 9 inches on the auger bit.